And build it, they did, over the course of many months. It started with nothing more than mulch. 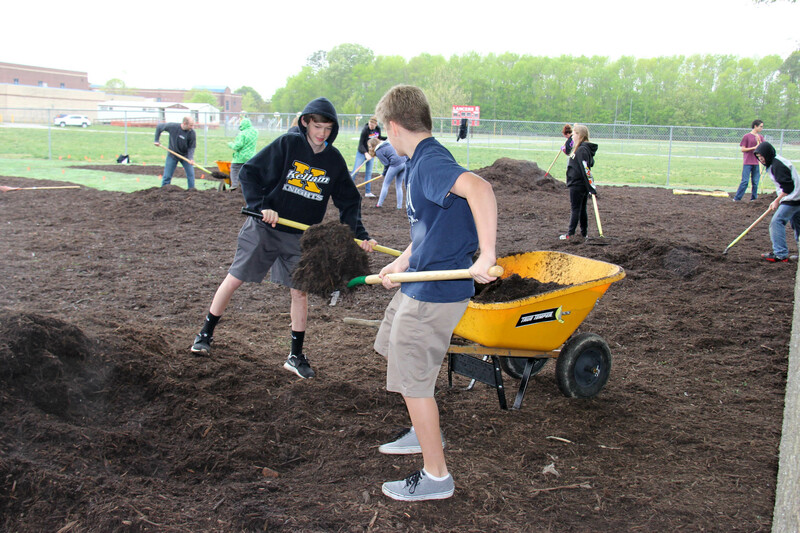 More than a dozen students, staff members, parents and community volunteers gathered in a drizzling rain on a Saturday morning in April to begin spreading mulch. More volunteers returned in May to plant flowers and vegetables while others offered their talents to construct wooden picnic tables, an arbor, a shed and welcome sign as well as to prepare brick and wooden walkways. 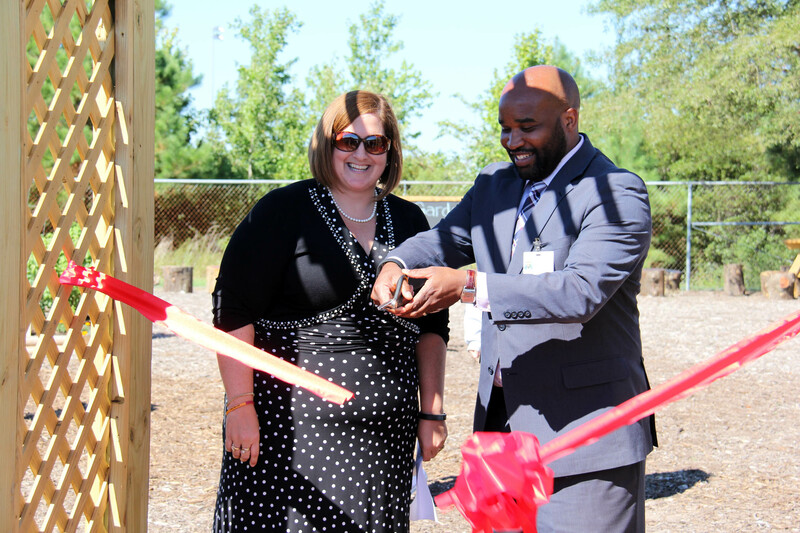 The months of planning, hard work and community collaboration to develop the 14,000-square-foot outdoor classroom were unveiled at a ribbon cutting ceremony Sept. 14. “Our field of dreams was an empty, grassy corner of the bus loop, and now it is a growing legacy of organic produce, beautiful plants and a handcrafted instructional space,” said Kelly Jackson, LMS health and PE teacher. Last year, Jackson and LMS art teacher Jennifer Lauzon applied for a Virginia Beach Education Foundation (VBEF) school wide grant to support this culminating work for Project SELF: Shaping Every Lancers Future. 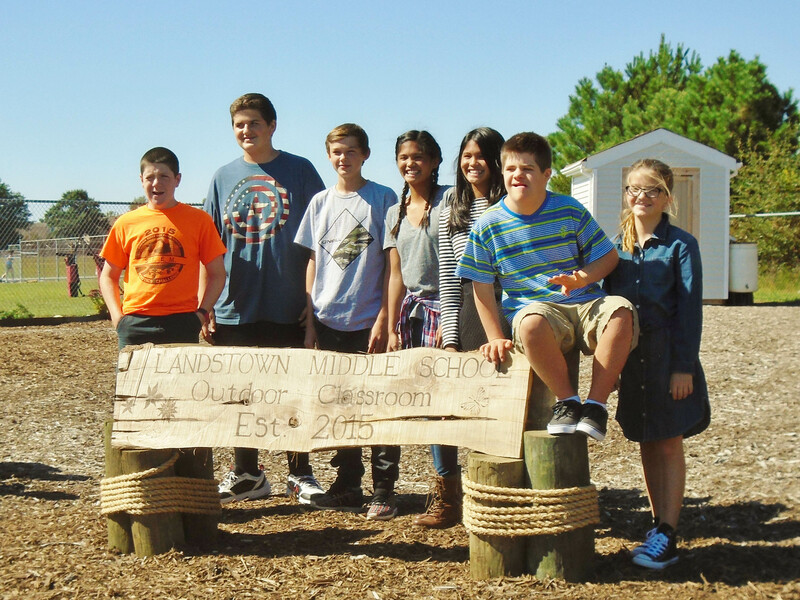 The $2,000 VBEF grant awarded to Jackson and Lauzon and underwritten by Optima Health was only the beginning of the outdoor project, and both teachers are quick to point to the leadership of LMS PTSA officer Carla Smith for making the field of dreams of reality. Smith sought gardening consultation from horticulturists at the Virginia Tech Hampton Roads Agricultural Research and Extension Center and from City of Virginia Beach landscaping services staff. She received donations of plants from places like Home Depot, Master Gardener and Tidewater Community College. She secured financial and material donations from businesses such as Lucky Oyster, Lifetouch, Office Depot, Kohl’s, Klar Orthodontics, Steam Pro Carpet Care, Chili’s, Seagreen Lawns and from various individuals. 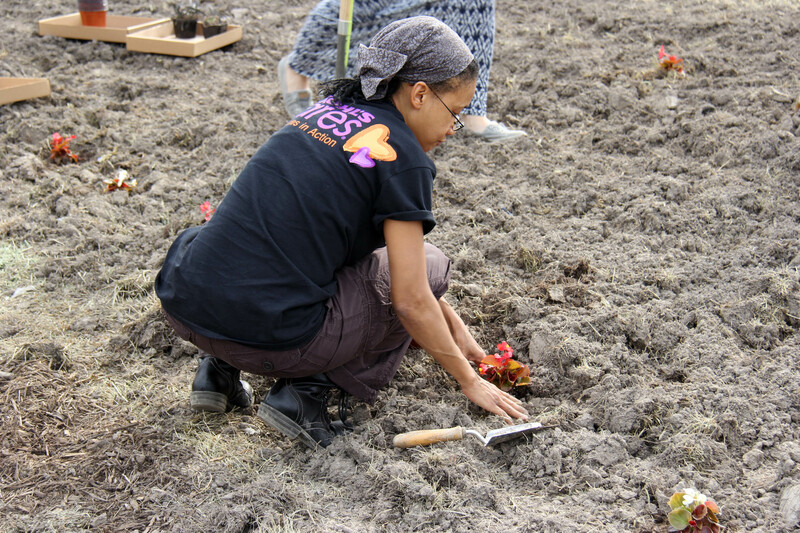 She enlisted the help of dozens of volunteers to help dig, plant and build. The opportunity to meet everyone involved with the project and bring people together is what Smith enjoyed most about the endeavor. Providing a unique learning space to students and staff is another benefit she hopes is realized from their work. The educational opportunities are what excite teachers like Jackson, Lauzon and their LMS colleagues. 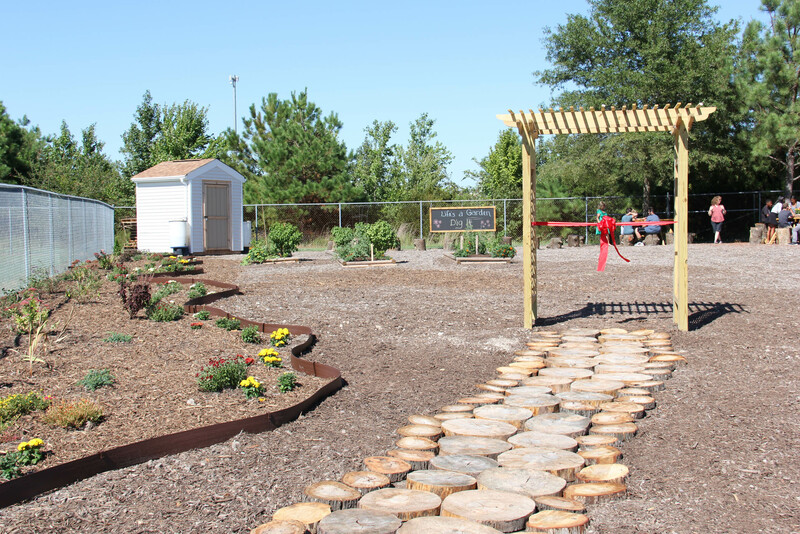 Jackson will use the outdoor classroom for health lessons that have students compare and contrast organic and processed foods, design healthy meal plans and create recipes using items grown in the garden. She also sees opportunities to tie in community health, community service and sustainability. “I will have students research the impact of our environment on the garden and the garden on the environments so they can see environmental health connections firsthand,” said Jackson. Science teachers can use samples from the garden to study soil pH levels and plant life cycles and to predict genetic variation of plants. Art teacher Lauzon has plans to take her students outside to create landscape drawings and Georgia O’Keeffe inspired artwork. They also can use plants to make dye and create clay imprints from items found in the garden. Sketching ideas for how to expand the outdoor classroom is another opportunity. “The possibilities are truly endless and ever growing and changing with the years,” said Jackson. The evolution of the project from initial staff collaboration and simple drawings to the widespread involvement of students, families and the community is what Jackson appreciates most. To read about more innovative learning projects supported by Virginia Beach Education Foundation grants, visit www.vbef.org. I can’t wait to come over for a tour of the garden! Landstown Elementary just received a grant to expand our outdoor garden and create an outdoor sustainability lab. Perhaps there will be some opportunities for collaboration between our students. Congratulations on creating a wonderful learning space!